Pink Roses are symbolic of grace and elegance, gratitude and appreciation. If your wedding colors are sprinkled with pink hues, this might just be the collection for you! This uniquely delicate candle design is adorned with pearl accents. Here, at Sam & Wishbone, a local candle design company located in Brooklyn, NY, we take great pride in our handcrafted candles. 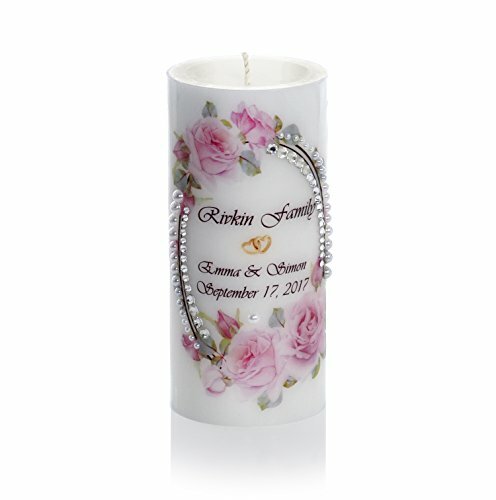 Each wedding candle set is customized with the couple's names and the date of the wedding. The candle's artwork is carefully chosen, and our multi-step printing process creates an intricate texture, embossing the candle with a dimensional art print. Made of not allergic unscented paraffin wax, each candle is embellished with rhinestones by hand. Order with confidence! Your satisfaction is our priority! SPARK UP YOUR WEDDING - If your wedding colors are sprinkled with pink hues, this might just be the collection for you! This uniquely delicate candle design is adorned with pearl accents. ELEGANT GIFT SURE TO BE APPRECIATED BY FAMILY - Our talented candle designers will adorn your Roses Wedding Candle Set with pearl embellishments, adding that extra special handmade touch. CREATIVE CUSTOMIZED CANDLE - Each wedding candle set is customized with the couple's names and the date of the wedding. This unscented pillar candle will complement your celebration. 100% SATISFACTION GUARANTEED - As a brand, we believe in quality! All our premium candles are made to standard providing you a long-time usage. This 3"x 9" candle will burn up to 90 hours. Order with confidence! Your satisfaction is our priority! Candle holders are not included. For display purposes only. View More In Candle Sets. If you have any questions about this product by Sam & Wishbone, contact us by completing and submitting the form below. If you are looking for a specif part number, please include it with your message.